Foster, who is known by the Essex fans as Fozzy, is often regarded as the best wicket keeper in the game. [ according to whom? ] 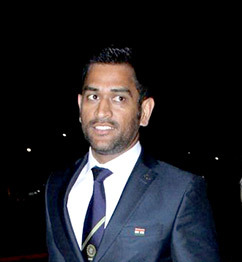 In July 2011, Alec Stewart described him as the best pure wicket-keeper in the world. This is a fact that is underlined by his ability to stand up to the stumps to many quick bowlers with consistency and excellence, and for his athleticism standing back. [ original research? ] However, he has been overlooked by England selectors as a possible result of perceived mediocre batting, with Matt Prior, Steven Davies and Jos Buttler being preferred. Foster's batting is reliant on cuts, pulls and sweeps. In all forms of cricket, Foster uses the reverse sweep effectively. Foster usually bats at seven for Essex in all forms. He once hit 5 sixes off of the first five balls of a Scott Borthwick over vs Durham in a Pro40, but missed out on the elusive sixth when Borthwick bowled a leg-side wide. Matthew James "Matt" Prior is a former English cricketer, who played for England in Test cricket and for Sussex in domestic cricket. He was a wicket-keeper and his aggressive right-handed batting enabled him to open the innings in ODI matches, even when he made very limited appearance in shorter forms of the game. 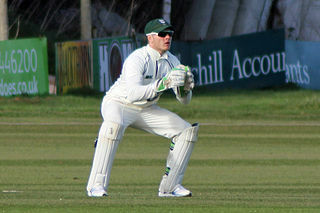 With an international Test debut score of 126, Prior became the first English wicket-keeper to hit a century in his debut match in early 2007. His glovework, however, was criticised. Despite a successful tour of Sri Lanka with the bat, Prior's keeping was less successful, and he was dropped from the team for the 2008 tour of New Zealand. He returned for the 2008 series against South Africa, and was retained into 2009, where he became the second-fastest England keeper to reach 1,000 Test runs, behind Les Ames. In his role as wicketkeeper, Prior has been described as 'a big talker behind the stumps' but has argued that this approach is different from the behaviour that saw him criticised during the 2007 tour by India; 'Ninety-five percent of the time, my chat is about geeing up our bowlers and the fielding unit.' He retired in June 2015 from all forms of professional cricket due to a recurring Achilles tendon injury. Steven Michael Davies is an English first-class cricketer, a left-handed batsman who currently plays for Somerset. He bats in the middle order in first-class cricket and opens in limited-overs. He started as a wicket-keeper, playing ODI and Twenty20 cricket in this role for England and has stated a desire to return to this position. Inter-county cricket matches are known to have been played since the early 18th century, involving teams that are representative of the historic counties of England and Wales. Since the late 19th century, there have been two county championship competitions played at different levels: the County Championship, a first-class competition which currently involves eighteen first-class county clubs among which seventeen are English and one is from Wales; and the Minor Counties Championship, which currently involves nineteen English county clubs and one club that represents several Welsh counties. The NBC Denis Compton Award is an annual award given to 'The Most Promising Young Player' at each of the 18 English first-class counties. A player may receive the award more than once. Dwayne John Bravo is a former Trinidadian cricketer, who played all formats of the game and a former captain of West Indies in all formats and plays league cricket for Chennai Super Kings & Quetta Gladiators. A genuine all-rounder, Bravo bats right-handed and bowls right-arm medium-fast pace. He is particularly known for his aggressive batting in the middle order, and for his "at the death" bowling. He is also known for his variety of lengths he can bowl at. He also performs as a singer.He sang the song for Quetta Gladiators in 2019. Alan Philip Eric Knott is a former cricketer who represented England at international level in both Tests and One-Day Internationals (ODI). Knott is widely regarded as one of the most eccentric characters in cricket, and is also regarded as one of the greatest wicket-keepers to ever play the game. He was described by cricket journalist Simon Wilde as "a natural gloveman, beautifully economical in his movements and armed with tremendous powers of concentration". Geraint Owen Jones is a former England and Papua New Guinea international cricketer. Born to Welsh parents in Papua New Guinea, he grew up in Australia from infancy. From 2004 until 2006 he was the first-choice wicketkeeper for England in both Test and One-day cricket, but subsequently fell behind Chris Read, Paul Nixon, Matt Prior and Tim Ambrose. He later played international cricket for Papua New Guinea from 2012 to 2014. He announced his retirement from first-class cricket on 8 July 2015 following his resignation as the first-class cricket captain of Gloucestershire County Cricket Club. Brentwood School, Essex announced on 4 September 2015 that he had joined their staff to replace the recently retired Brian Hardie as cricket coach. Rodney William Marsh MBE is a former Australian wicketkeeper. Steven John Rhodes is Bangladesh National Cricket Team Head Coach. He was best known as a wicket-keeper, but was also a useful number six or seven batsman, making twelve first-class centuries. James Graham Binks is a former English cricketer who played as a wicket-keeper for Yorkshire. Although he was regarded by many as the best wicket-keeper of his generation, his limited batting ability restricted him to just two Test match appearances for England, both on the 1963-64 tour to India. Ironically, because of injuries to other players, he opened the batting in three of his four Test innings. Alan Christopher Smith, known as A. C. Smith is an English former Test cricketer, who appeared in six Tests for England. Primarily a wicket-keeper, Smith was also a capable right-handed middle-order batsman and right-arm seam bowler. Very unusually for a regular wicket-keeper, he was sometimes selected by Warwickshire as a frontline bowler. Bradley James Haddin, is a former Australian cricketer and former vice-captain who represented Australia in all three forms of international cricket. He also played for the New South Wales Blues in both domestic first class and list A cricket. Haddin is a right-handed batsman and wicket-keeper. He was a member of the Australian World cup winning squad at the 2015 Cricket World Cup. He retired from One Day International Cricket on 17 May 2015, soon after the 2015 Cricket World Cup. He also became the ambassador for his home ground, Sydney Cricket Ground (SCG) along with Steve Smith. Haddin announced his retirement from international and first class cricket with New South Wales on 9 September 2015. He played for the Sydney Sixers in the Big Bash League. Ian James Gould is an English former first-class cricketer and latterly an ICC Elite Panel cricket umpire. He previously also served as the chairman of English football club Burnham FC. James Michael Parks is an English former cricketer. He played in forty six Tests for England, between 1954 and 1968. In those Test, Parks scored 1,962 runs with a personal best of 108 not out, and took 103 catches and made 11 stumpings. Benjamin James Matthew Scott was an English first-class cricketer. He was a right-handed batsman and wicket-keeper. He was born in Isleworth, Middlesex. George Owen Dawkes was a first-class cricketer who played for Leicestershire between 1937 and 1939 and for Derbyshire between 1947 and 1961 as a wicket keeper and a lower-order right-handed batsman. During the 1949–50 season he toured India with a team of players making up a Commonwealth XI. Roy Booth was an English first-class cricketer, who played for both Yorkshire and Worcestershire. He was born at Marsden, West Yorkshire. George Rodney Cass was an English cricketer: a wicket-keeper who played first-class cricket for Essex and Worcestershire in England, and for Tasmania in Australia, in the 1960s and 1970s. He was capped by Worcestershire in 1970. Oliver Benjamin Cox is an English cricketer who plays county cricket for Worcestershire as right-handed batsman and wicket-keeper. Derbyshire County Cricket Club in 1899 was the cricket season when the English club Derbyshire had been playing for twenty-eight years. It was their fifth season in the County Championship and they won three matches to finish fifteenth in the Championship table. Wikimedia Commons has media related to James Foster (cricketer) .